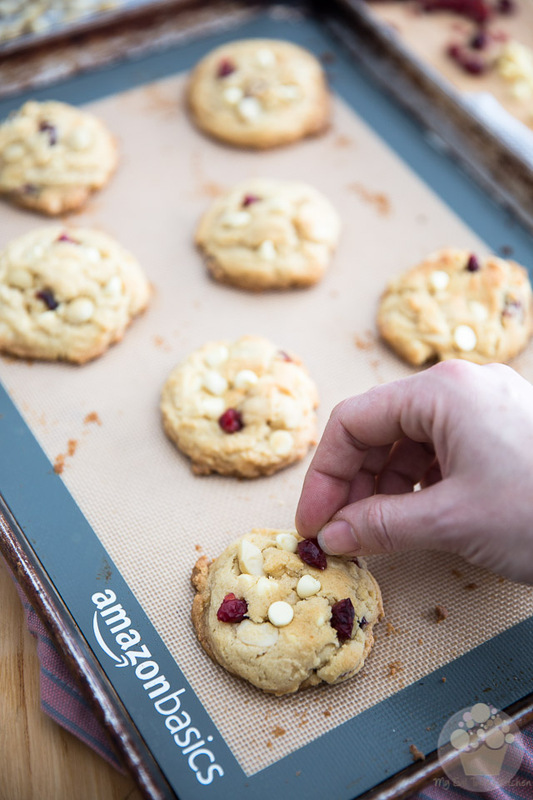 Deliciously soft and chewy White Chocolate Macadamia Cranberry Cookies – so crazy good, you’ll get totally addicted with the very first bite. Last week, I paid a visit to my favorite tattoo artist in the whole wide world, so he could lay down the outline of my brand new ink project, a Cinderella sleeve this time. 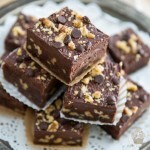 Usually, I tend to bring stuff that’s totally decadent, like these Raspberry Swirls Cheesecake Bars or these Coffee Nanaimo Bars, but I was a little crunched for time that week, so I chose to make a couple of batch of cookies instead. 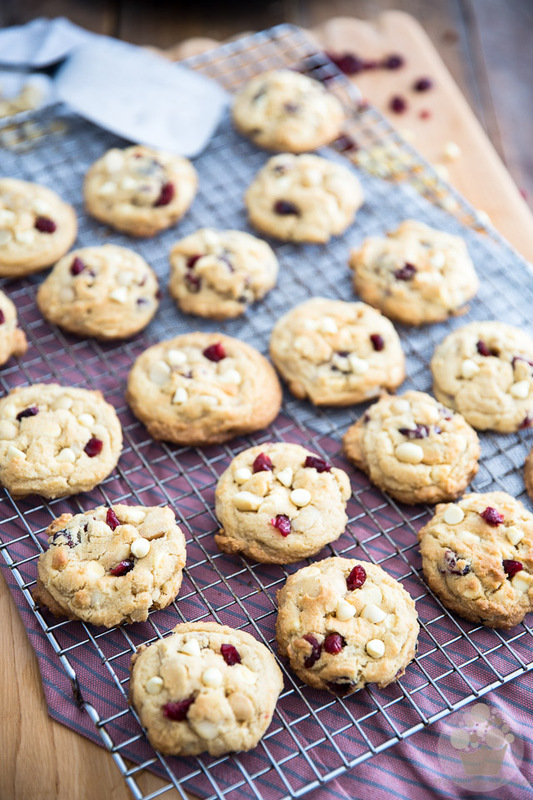 Classic Chocolate Chips, to start, and then these ridiculously soft and chewy White Chocolate Macadamia Cranberry Cookies. 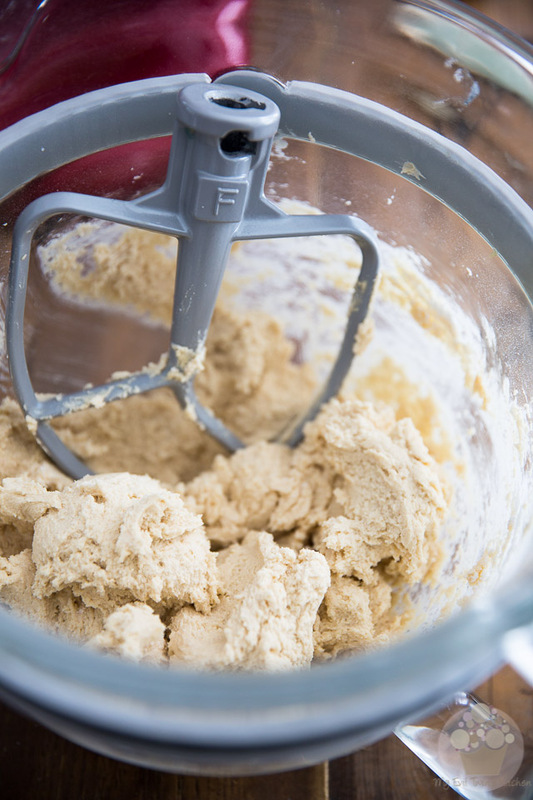 What I really like about cookies is that you can make the dough way ahead of time and then bake it on demand when you’re ready to indulge! Knowing that I wouldn’t have time to work on any real serious project the day preceding my session, I figured that cookies would be my best option. I could make the dough up to several days in advance and then all I’d have to do is bake them the day before my appointment. Ha! Perfect crime! These cookies, they’re so crazy good, you’ll get totally addicted with the very first bite. 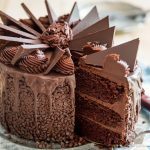 They’re thick, they’re dense, they’re chewy, have a deliciously soft center and crispy edges, plus, they’re LOADED with tons of yummy goodies. 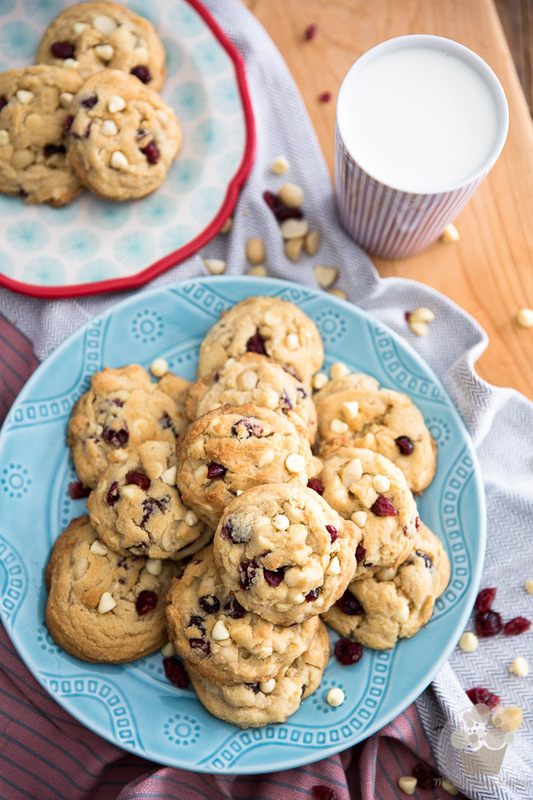 Nothing can quite beat the combination of crunchy macadamia nuts, sweet and creamy white chocolate chips and tangy, zesty cranberries. Every one at the parlor thoroughly enjoyed them… including myself! One of the artists there even came to tell me that she’d just sampled the best cookie she’d ever eaten in her entire life. HA! To say that I was flattered would be an understatement. 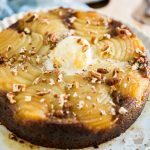 With that in mind, I think that you should seriously consider whipping up a batch today… or even tomorrow, why not? 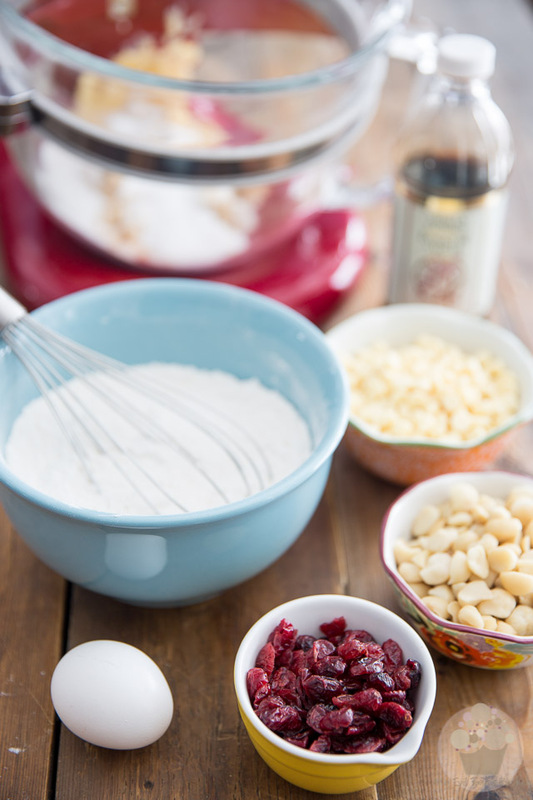 While you’re at it, weigh or measure your white chocolate chips, macadamia nuts and dried cranberries; take an egg out of the fridge and your vanilla extract out of the pantry. 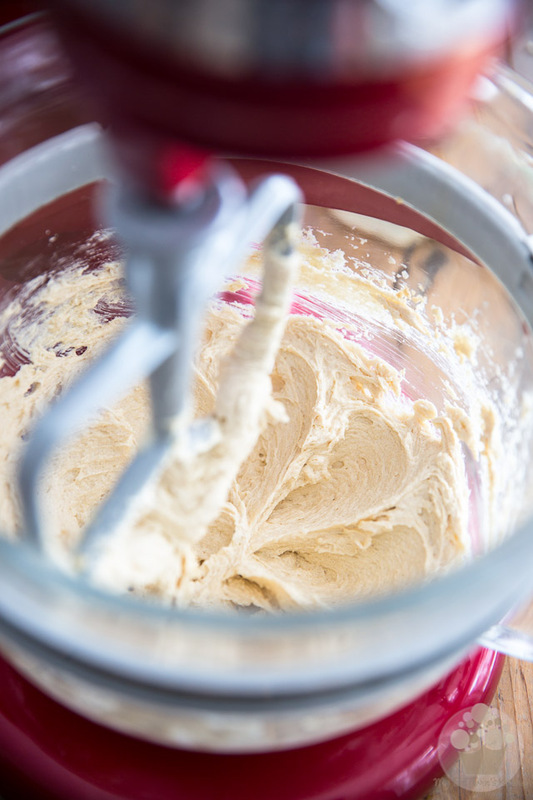 Then, in the bowl of your stand mixer fitted with the paddle attachment, combine the butter and sugars; beat those together for 2 minutes on high speed until light and fluffy. 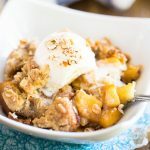 While not entirely mandatory, the lemon extract contributes in adding a lot of depth and intensity to the flavor of your cookie dough, so if you happen to have some on hand, I strongly suggest that you do add a few drops to your dough. And then slowly add in the dry ingredients, all at once. Mix on low speed until just combined, no more. 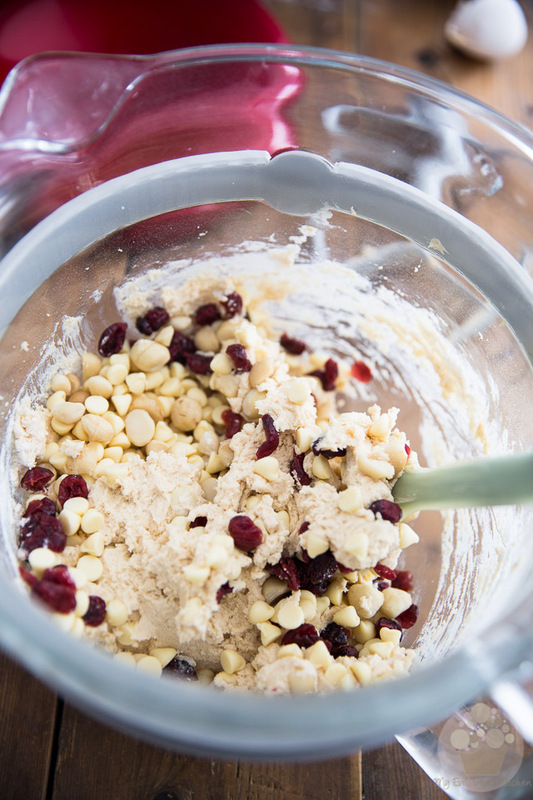 Add the white chocolate chips, macadamia nuts and cranberries and fold them in delicately with a rubber spatula. 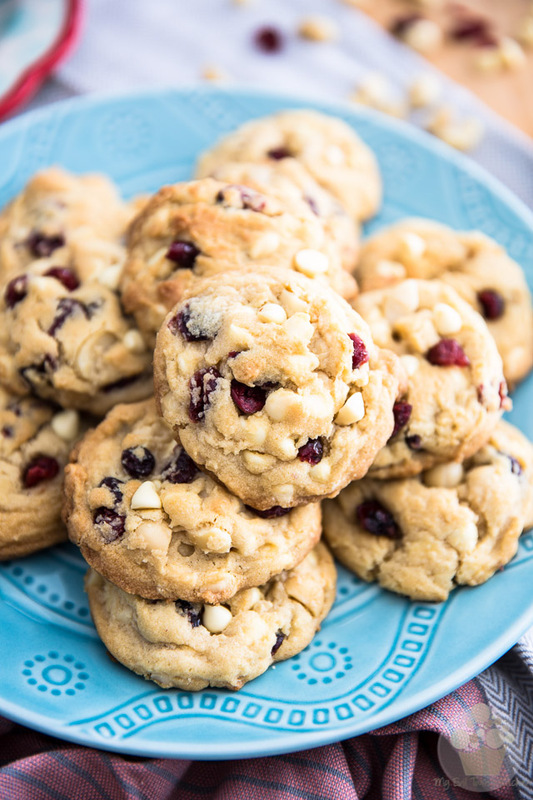 Oh, before you throw all this in the bowl, make sure to keep a few pieces of macadamia nuts, white chocolate chips and dried cranberries to garnish your cookies when they come out of the oven. Unless of course there was more of this where they all came from, in which case you could just throw everything right in! 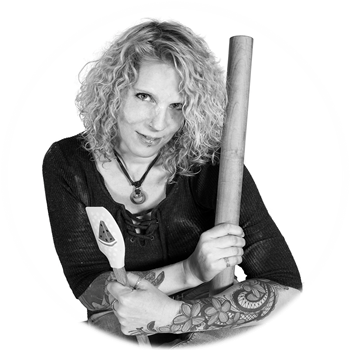 I like to use a large spring-loaded ice cream scoop to do that: not only does it scoop equal amounts of dough every time, but it also takes care of pre-shaping the cookies for me. 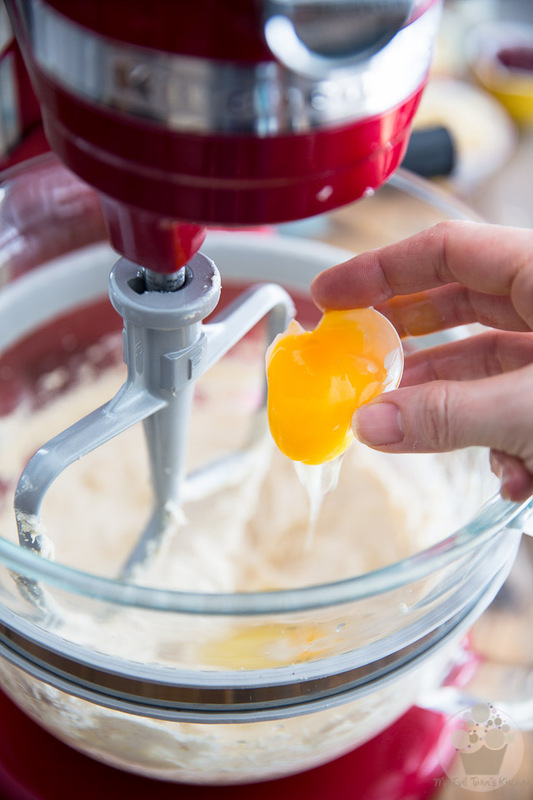 Of course, if you didn’t have one of those, a large spoon would also do the trick – you’ll want to use about 3 tbsp of dough per cookie, and then shape the balls with your hands. 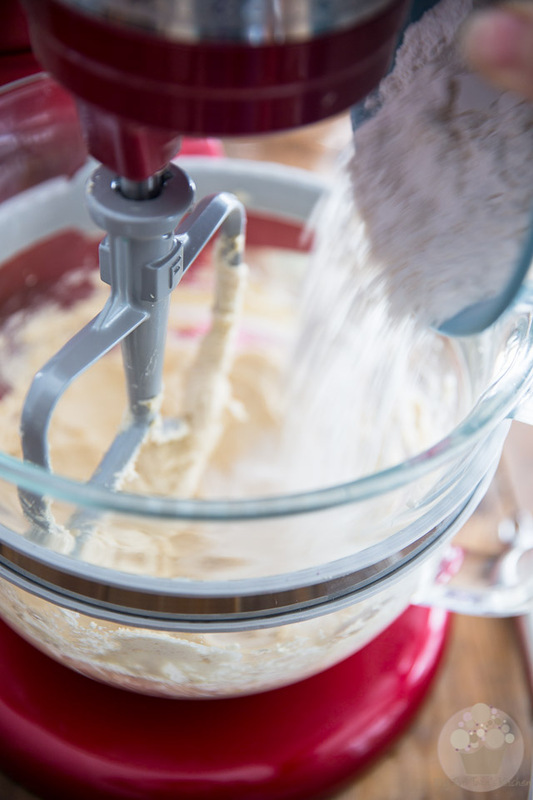 You should be getting around 20 dough balls in total. Once you’ve shaped them all, send them to the refrigerator for at least 2 hours – or even up to several days if you keep them well covered. 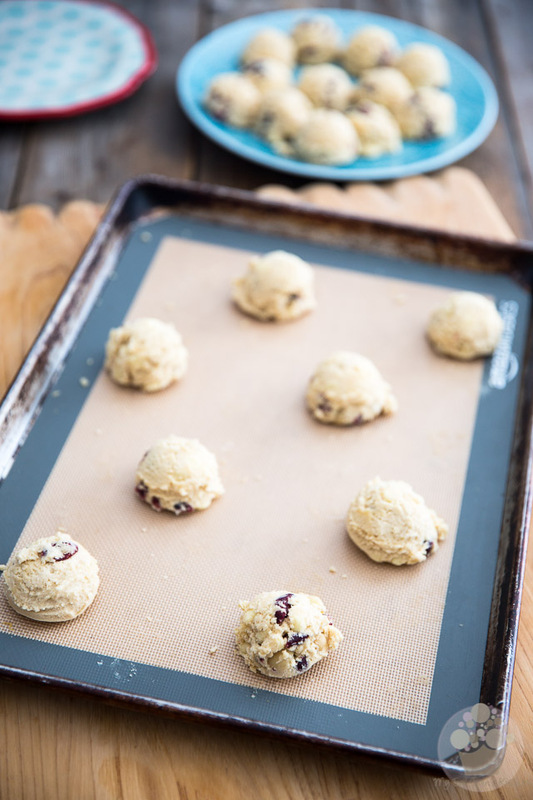 Transfer your balls of chilled cookie dough to a plate, leaving only 8 to 12 on the cookie sheet; make sure to leave at least 2 inches between each cookie, to allow for spreading. Return the rest of the dough balls to the refrigerator so they remain cold while these ones will be in the oven. 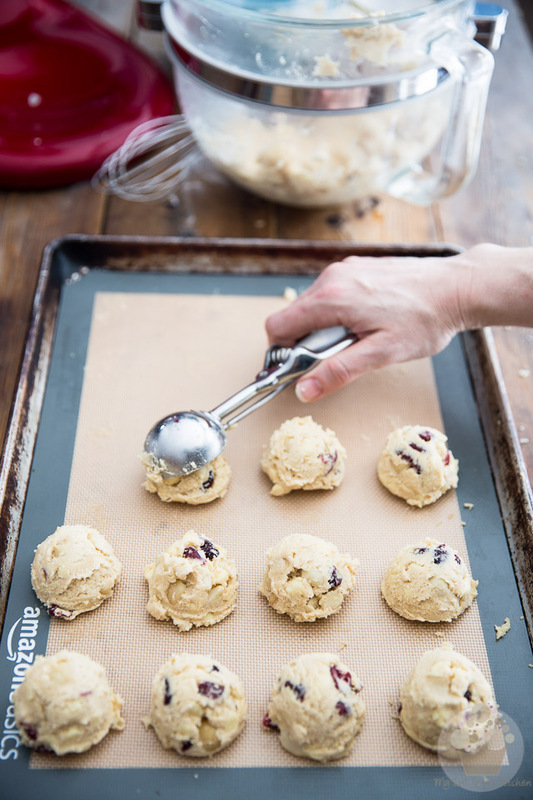 As soon as the cookies comes out of the oven, push a few pieces of nuts, white chocolate and cranberries into the soft dough while it is still soft and pliable; this will make your cookies so much prettier! 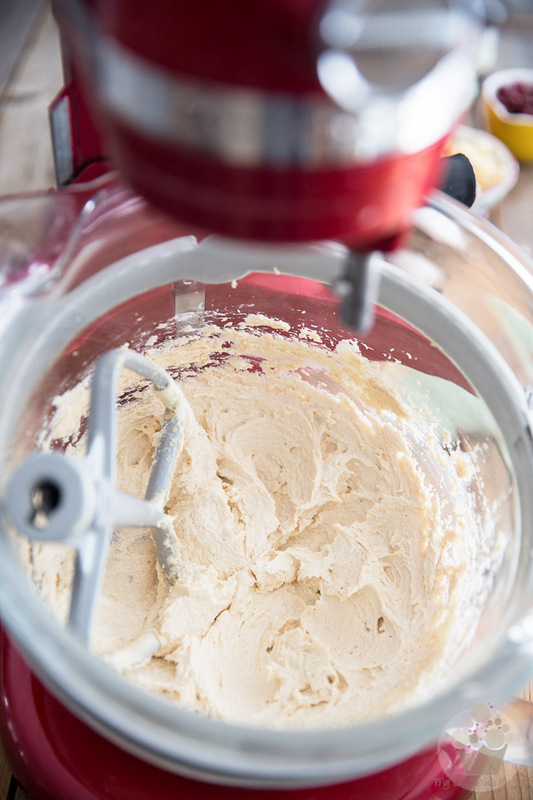 In the bowl of your stand mixer fitted with the paddle attachment, combine the butter and sugars; beat for 2 minutes on high speed until light and fluffy. Add the eggs, vanilla and lemon extract and beat for 2 more minutes. When you are ready to bake your cookies, preheat the oven to 350°F; transfer your chilled balls of cookie dough to a plate, leaving only 8 to 12 on the cookie sheet; arrange them so they are at least 2 inches apart. Return the other dough balls to the refrigerator. Bake the cookies for 10-12 minutes or until they are nicely browned around the edge, have a beautiful golden top but still look somewhat soft and slightly underdone in the center. 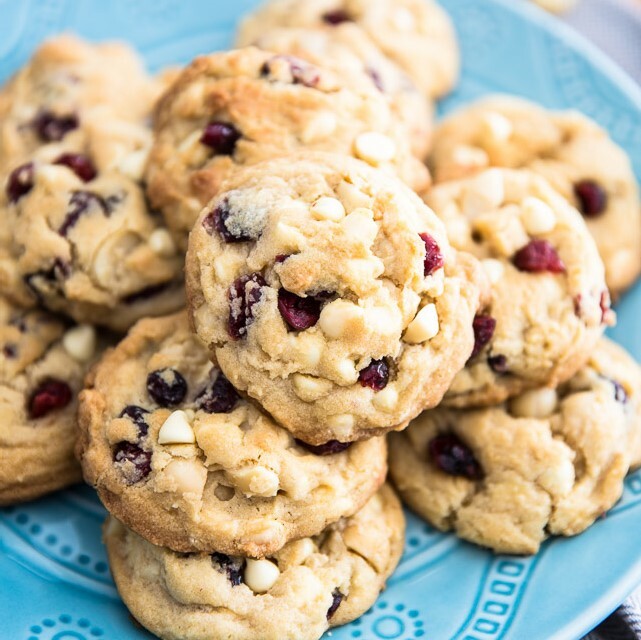 As soon as the cookies comes out of the oven, push a few pieces of nuts, white chocolate and cranberries into the soft dough for prettier cookies. You will be all over these cookies, Jordan, I’ve no doubt about it. I really can’t wait to hear your thoughts. Where is the recipe for these cookies? Made these yesterday and they are still soft and fresh this evening!